Do you get it? DO YOU? I'm not sure if you get it. This lovely print by Biotwist wonders not "What if Wolverine and Batman played guitar… what if they were guitars?" The results, as you can see, are a lot of fun. 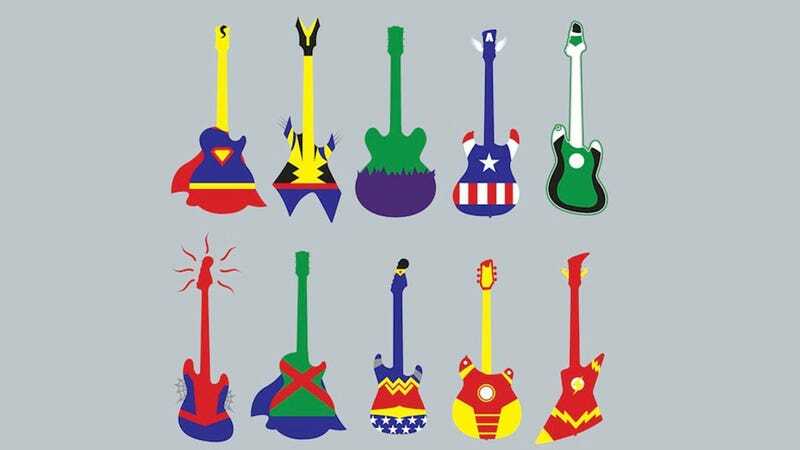 I like that Superman is a Les Paul, and Hulk appears to be a Gibson 335. Which, yeah, fits. You wouldn't like a 335 when it's angry. I also buy Flash as an Explorer, and Batman is a total SG. Robin as a Telecaster, though? Not so sure. Also woulda pictured The Punisher as some sort of B.C. Rich death guitar, but that's just because there probably is a B.C. Rich guitar called "The Punisher. You can order these on a print or on a T-shirt here, and I for one fully plan to do so.